This Euro-style dream villa near Siesta Key is just a stones throw from the Intracoastal. It sets the stage for your tropical Florida lifestyle. Enjoy cooling breezes from the Gulf of Mexico as you arrive home to your own slice of paradise. Light, bright, and brimming with beach cottage charm, the interior has been remodeled with care and attention-to-detail. Prepare fresh ingredients from the nearby Phillippi Farmhouse Market in the remodeled kitchen with new cabinets, and granite surfaces. New tile flooring flows from space to space with turnkey furnishings providing a cozy atmosphere. The two newly-carpeted bedrooms are on opposite ends of the house, providing space and privacy. A spacious lanai overlooks mature landscaping and is perfectly poised to enjoy shaded afternoons. Easy to use metal hurricane shutters on the lanai provide peace of mind for long European adventures. Maintenance-free living is the order of the day with community HOA & new AC installed in 2017. A community clubhouse and large pool make it easy to socialize without leaving your street. Walk the waterside and enjoy the outdoors or go relax by the pool. The clubhouse also has a library, exercise machines, billiards, ping pong, a social room, and a kitchen. 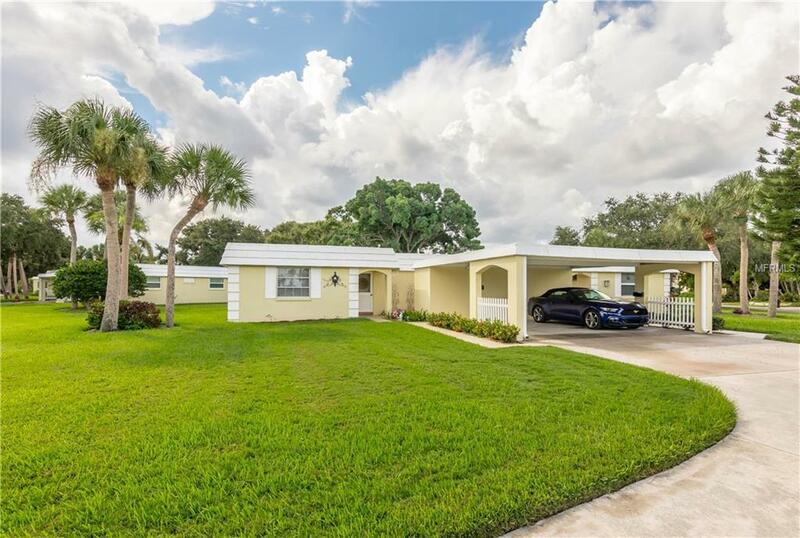 This friendly community is only five minutes to Siesta Beach and two shopping malls, and ten minutes to downtown Sarasota with an endless variety of arts and culture. Great location, perfect condition, turn-key furnished when can we show it to you?